We've been making our way through a detailed accounting of the compliance tests for Automotive Ethernet, and in our last post, we covered the distortion test. Now we'll wrap up the tour of the compliance test suite with the test of transmitter power spectral density. This test is performed using test mode #5, which is a PAM-3 transmission of a random data sequence. The specification supplies upper and lower test limits, and the test can be performed with a spectrum analyzer or an oscilloscope with spectral-analysis capabilities. It verifies that the power spectral density does not escape the boundaries of a specified pass/fail mask (Figure 1). Performing the PSD test with an oscilloscope entails using the instrument's FFT math function, setting it to calculate power spectral density. 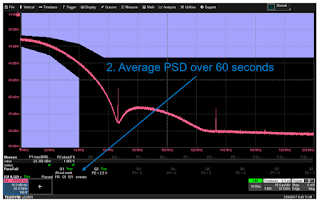 We average the power spectral density measurement over a 60-second acquisition (Figure 2). 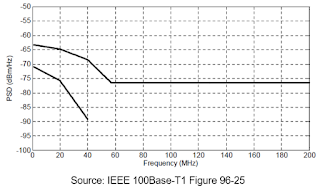 Averaging gives us a good determination of the signal's frequency content, and also averages out any random noise. The test concludes by applying the specified pass/fail mask. 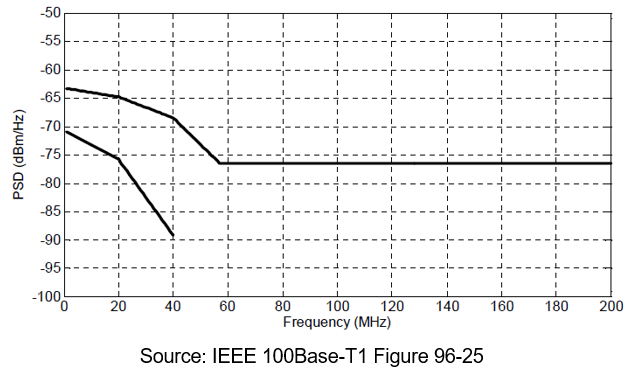 The final Automotive Ethernet compliance test in our series is for transmitter peak differential output, which is defined in the 100Base-T1 specification but not in the BroadR-Reach spec. 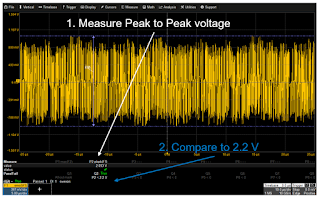 This test, which uses test mode #5, measures peak-peak voltage during normal operation and verifies that the signal does not exceed the maximum amplitude of 2.2 V pk-pk (Figure 3). We performed this test simultaneously with the aforementioned power spectral density test. 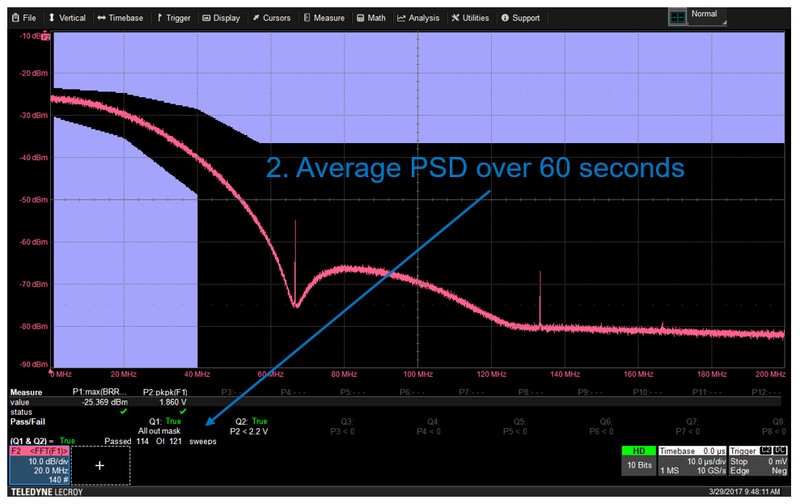 The specification offers no guidance as to record length; we recommend 10 μs/div, which is the same record length used for the PSD test. The test is rather simple. 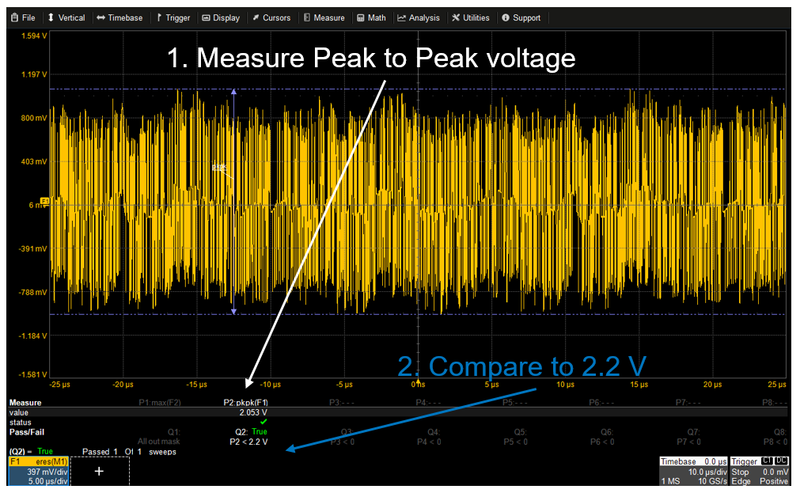 Your oscilloscope has a peak-to-peak voltage parameter measurement. Turn it on and check that the signal's peak-to-peak voltage amplitude does not exceed the 2.2 V pk-pk limit in the specification. We'll conclude our series on Automotive Ethernet test in an upcoming final post with a look at test equipment requirements.